Establishing the correct identity of visitors to an estate or complex is crucial to effective security. In the past, the tattered visitors’ book was standard at every gate, but now, everyone knows that these books are ineffective as information is largely inaccurate and mostly illegible. Moreover, with the Protection of Personal Information (PoPI) Act, paper-based access control registers will no longer be compliant and will become obsolete. OnGuard has developed a solution for visitor management called Identiscan, a hand-held mobile data terminal effective in scanning both motor vehicle and driver’s licences. When using the Identiscan Electronic Visitor Management System (EVMS), all data is encrypted and stored offsite on a secure server to meet the most stringent regulatory requirements. The system ensures both the identity of the user (the guard) as well as the visitor. Before using the device, the user first enters their PIN to identify them. This ensures that they remain accountable for management of the scanner as well as the allocation of the access record to the specific guard. There is no longer an option to say “I didn’t let that person in”. • Elimination of paper-based access control registers. • Improved speed of processing visitors and contractors. • No computer required as the data stored offsite. • Automatic warnings of undesirables people/vehicles. • Direct control of the gate or boom via the scanner. “Identiscan is a massive deterrent for someone who wants to enter illegally. It also prevents people who don’t have a valid registration or identification from entering – there is just no basis for argument. If they don’t have a driver’s licence, they simply don’t come in,” explains Tony Heath from Stable Yard Estate. 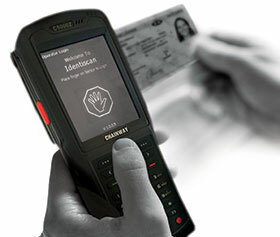 For more information contact Identiscan, +27 (0)21 701 7777, www.identiscan.co.za. The modern shopping centre can only be secured via a multifaceted approach to the security solutions deployed.